I frequently get questions about photographing black cats and dogs. Especially from shelter photographers, as black cats and dogs have a harder time finding homes, and photos showing them as black blobs don’t help. Special attention to lighting and exposure are key to capturing their happy, smiling faces. Modern cameras do a great job of calculating proper exposure in many situations, freeing us to focus on other details, like expressions and background. But cameras still guess what’s most important in a scene and set an exposure accordingly, and sometimes that guess is wrong. For instance, if you create a photo of a black dog hiking in a forest, the camera may decide the trees are most important and compute an exposure that leaves your dog underexposed — sadly looking like a black rock. Luckily, many cameras have “exposure compensation” that lets you adjust for more or less light than the automatic calculations suggest. You’ll need to experiment, but in the case of a black dog in shade, try starting with an exposure compensation of “-1.” This causes the camera to let in a full stop more of light. Experiment until your dog or cat gets the exposure they need to shine. By the way, with white cats or dogs you may try a compensation of “+1” to bring in less light. Besides getting a proper exposure, the direction and quality of the light are especially important with black furry subjects. Our brains use shading and shadows to create a 3D shape from a 2D photo. And some angles of light are much better for giving our brains the visual cues they need to see form and texture. We’ll use what’s known as “raking” light. Imagine photographing a bunch of black chopsticks placed parallel with space between on a black table. If you pointed a light straight down at the table, the chopsticks and the table would get the same amount of light, visually blurring both, resulting in a flat black image. Imagine instead lighting the chopsticks from the side so the tops got a full hit of light while the spaces in between are in shadow. Now your brain has lots of shading cues it can use to see the shape of the chopsticks. We want to use the same principle with our black furry friends. An on-camera flash is like light aimed straight down at the chopsticks — washing away detail. On the other hand the sun, low in the horizon and to the side is like the light going across the chopsticks. Now facial features create shadows that make the shape of their face pop. Plus the top of their fur gets more light while the “valleys” between are darker, showing their fur’s texture. Subtle differences in the angle of light make a big difference, so as always, you’ll need to experiment to perfect this technique. 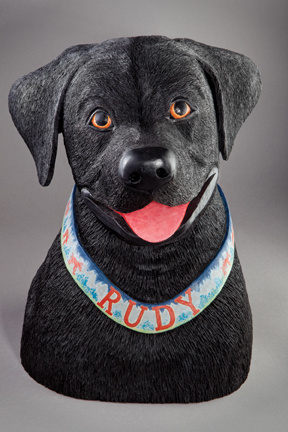 The photo I’ve included is of an amazing carved wood sculpture of a black dog I photographed recently. The sculptor is Jim Liedtke (http://www.flickr.com/photos/jimliedtke). To show off all the details, I used the technique described above, placing strobes on each side of the sculpture pointed at oblique angles. Those two lights alone created too much contrast between light and dark so I filled in some shadows and added highlights using a third strobe and a reflector positioned close to the camera. While I used a bunch of equipment, the same principal works with natural light. Just experiment with different light angles and soon you’ll be wowing your friends and proving that black cats and dog can look great in pictures. If you’d like to learn more, I’ll be teaching a two-session class at Oregon Dogs Inc. July 15 and 29. Details oregondogsinc.com. Or email me at david@davidchildsphotography,com. Hope to see you there! July 1, 2012 by David Childs.